Removal of the objective by clicking on the menu File and selecting from the options Groups. 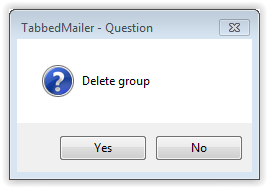 On the right side of the window we select the group would like to remove a single click, and then click the left side of the position Delete group. We are asked by the system whether really want to delete the group. Click on the button Yes. The group was deleted.